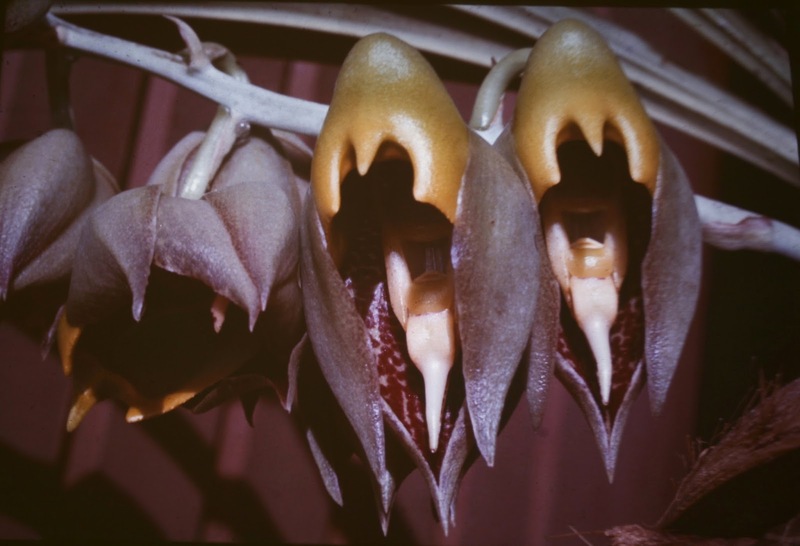 The broodingly sinister Vampire orchid - Catasetum macrocarpum is a large tropical epiphyte native to the Caribbean and South America. An epiphyte is a plant that grows non-parasitically upon another plant and receives its moisture and nutrients from the air, rain, and the natural debris that accumulating around it. The fragrant blooms appear in the late summer and autumn on a flowering spike that rises from the pseudobulb at the base of the plant. 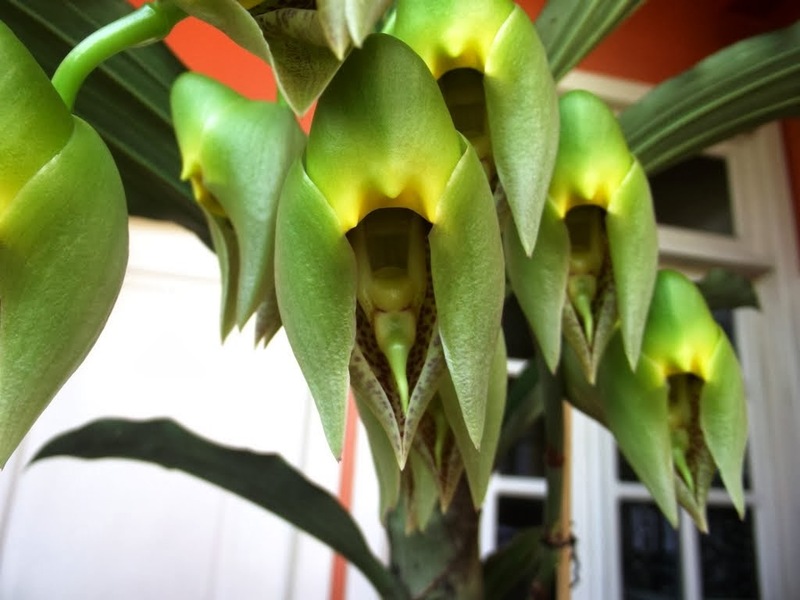 These flower spikes appear just before leaf-drop and can be up to 1 1/2 feet long. Up to 10, fleshy flowers are produced on each spike, and produce a fragrance similar to anise. The flowers tend not open well outside of their natural environment. The male flowers pollen sacs, known as a pollina, is triggered by a pollinating bee which touching the spur inside the hood as it enters the flower trying to reach its nectar. This triggers the pollina with attaches itself to the bee with an assertive push. 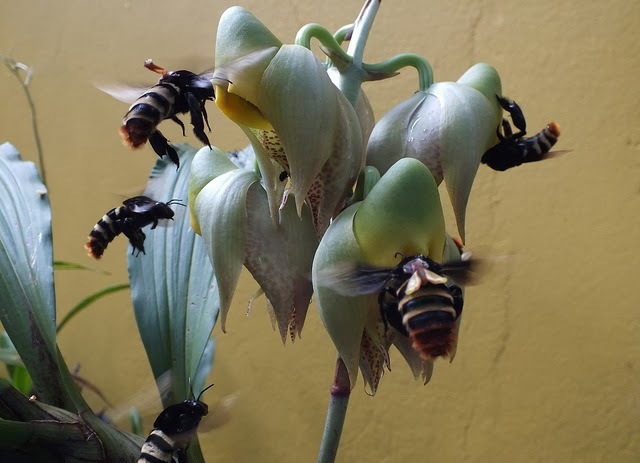 There is a sticky gel known as viscidum at the bottom of the stipe (a stalk-like attachment on the pollina) which glues the pollina in place on the bees back. When the bee enters a female flower the pollinia fits into it like a key in the lock and ensures pollination. You can grow the vampire orchid in intermediate to warm conditions with partially bright light. Plants are usually grown in pots containing bark chips with perlite, cork, or just sphagnum moss. Just make sure that they have excellent drainage. They will need to be watered regularly during the growing season, but one the plant begins to drop its leaves in the autumn watering will need to be reduced. During this period of dormancy you will only need to water once every couple of weeks to keep pseudobulbs from drying out. You can resume normal watering once new growths emerges in spring. Be aware that the vampire orchids can easily die from overwatering.